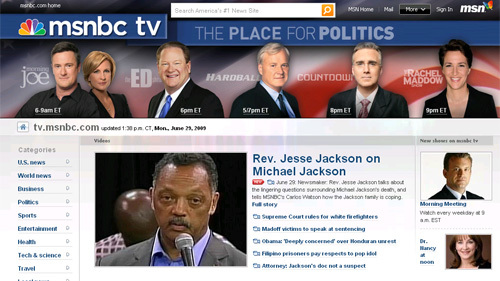 The msnbc tv pages have been update to include the same logo used on the Web site its latest redesign. That new logo keeps the NBC peacock in a prominent location but switches to a rounder, more contemporary typeface. It’s also interesting to note that on the msnbc Web site, the television section is being branded as “msnbc tv” with the “tv” set in the same font. The logo switchout has been a long time coming and it always irked me that the two logos were being used at the same time. While many TV stations have distinct logos for their Web sites, the two msnbc looks were too similar and mixing between the two often looked more like an oversight than a conscious decision.